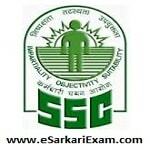 Eligible Candidates can Download SSC CHSL Tier I Result/Marks at the Official Website of SSC. Open Result Tab and Select CHSL Link. Open CHSL Tier 2017 I Exam Result Link. Check & Download Result By using Roll No. & Name. For Marks Click CHSL Tier I Exam 2017 Marks. Open Given Link and Fill Login Details. Click Submit Button & Check Marks.